Fiji has long been one of the most popular family-friendly holiday destinations for Aussies travelling abroad. Fijians just love children and their friendly charm and natural affection make them the most fabulous hosts for family holidays. Their big, wide smiles and never ending kindness makes them part of the family in no time and keeps families coming back year after year. Best of all, most Fiji resorts offer an onsite kids club where children of all ages are invited to make new friends and join in a fun yet educational range of supervised activities including beach volleyball, treasure hunts, bush walks, sand castle building, storytelling sessions, language lessons, cooking and even visits to the local kids in the village. In fact, Fiji is so famous for its kids clubs that deciding which one is the best for your family might seem like a mammoth task. Lucky, we’ve done the hard work for you. Located on Denarau Island, kids who join the club will receive a ‘Banana Passport’ on arrival. Filled with fun activities to complete, this will keep them entertained for days. The complimentary children’s program at Jean Michel is award-winning and offers entertaining yet educational activities designed to help kids explore the surrounding area and discover everything the resort has to offer. For high-tech kids, this club has an app that allows children to put together a virtual scrapbook of all their holiday memories and to test their knowledge of the world. 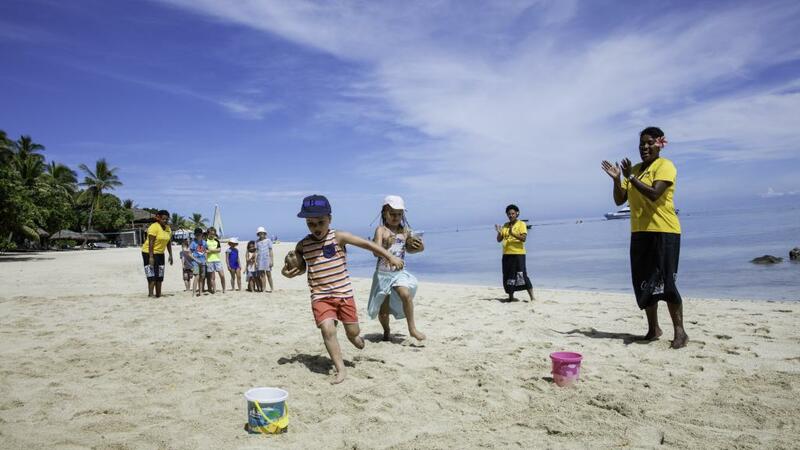 Let your kids get a taste for the real Fiji at this entertaining kids club that offers a fantastic range of Fijian activities such as coconut boat racing, crab racing, fish feeding and more. Known for being plenty of fun, this kids and teens club is secretly designed to be engaging and culturally educational – the kids will be so entertained they won’t even notice. Try not to get jealous, but your kids might just have more fun than you at this highly entertaining kids club that lives by the motto of ‘no adults allowed’. Sit back and relax at this Fiji island favourite with a free kids club that will keep the little ones entertained day and night with a program of activities that have a distinct Fiji flavour. With days jam-packed with fun activities, your kids will be talking about this coco-nutty kids club long after you return home. They’ll enjoy activities such as coconut husking, cooking classes, nature walks, Fijian language games and much more.